I just know there are houses that you pass by regularly that you always glance at because they just call out to you. This is mine. It is on Silver Street, and I pass it numerous times per week. It’s beautiful, and it just screams historic New England. This is even the second time I’ve shown you that handsome black door. So, why the repeat? In those two parallel beds next to the walkway, they always had a row of red geraniums plants in the ground that were quite eye-catching. But, this year, they installed six massive black iron urns planted with annuals that just almost stop my gardening heart. My yearly gardening budget probably wouldn’t cover the cost of one of those planters, but I sure do enjoy them when I drive by. If anyone would have asked me if the home owners could have done anything to draw more attention to this door and house, I would have been at a loss for suggestions. Someone with extremely good taste has certainly shown me how to increase curb appeal with the addition of six planters proportionate to the size of the house. Garden on. This post is linked to the head door aficionado, Norm Frampton’s, Thursday Doors, August 30, 2018. 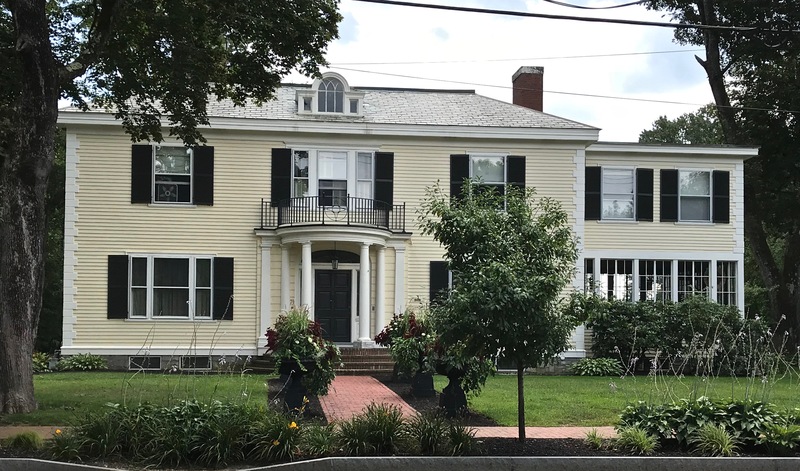 This entry was posted in Photography, Thursday Doors and tagged Black door, Curb appeal, New England, New Hampshire, Photography, Thursday Doors. Bookmark the permalink. LOL Before you expressed the same sentiment in your second-to-last paragraph, I was thinking to comment on the rare blend of “money” and “good taste!” Beautiful elegance here! That’s certainly worthy of a repeat visit. Those planters are huge, but, as you say, in proportion. It’s sleayd good to see that. And, it’s a beautiful door/entrance. TOTALLY agree have admired them on the drive by. ooh, la la! Great eye, Judy. So special to have a place you feel drawn to in the way of beauty or uniqueness, a pleasure to pass by over and over again never losing its charm. There is a farm one town over from me that has always had this appeal. Two brothers, now quite elderly, grew potatoes ( and other crops) on that farm. It is quite grand, typical New England, with all its outbuildings and well-kept fields and pasture. I’ll go over soon and take a good look at the door to their farmhouse, maybe ask if I can take a picture…you’ve inspired me! Looks lovely either way, Judy. I can see why you admire it and the combination of money and good taste is to be appreciated. I’m still hoping to enjoy more summer for a time. Enjoy staying at home over the weekend. That can be quite nice as well. What a gorgeous place with gorgeous taste! Great door with a stunning Welcome! This place is magnificent. Those planters couldn’t be more perfect, and as beautiful as the whole property is, they enhance that beauty. Boy! Don’cha just want to see inside? My imagination is exploding! Wishing you and Dennis a “tourist free” holiday weekend. I like the look of their sunroom too! This one looks like something straight out of a movie. So pretty. Thank you for sharing. It is a lovely home and yes, I like the newly planted urns as well. Try and stay cool over the holiday weekend. You’re probably quite wise to stay off the interstate this weekend. We’re headed to the country — rural North Carolina — to a pottery show and then to Biltmore where lots of tourists will flock to see the Chihulily exhibit. But it should be fun. Happy Labor Day! Definitely a drool-worthy home! I love those planters, too! Tres elegant! Like Marian, the sunroom caught my eye. Sun porches in our climate are a wonderful thing. Am all for a grand entrance! The black touches make it rather elegant:) Great find, Judy. Such a beautiful building, Judy. Love the black shutters against the white. What a gorgeous classic New England home! Makes me miss living back east in CT. Have a wonderful weekend. As Joyce said in the opening comment, this is where money and good taste intersect! Both elegant and tasteful. My favourite part of that house is the side extension with the great room enclosed in windows. I would LOVE to have a room like that!! Those lovely urns look to be filled with a mix of flowers, and stuff. I love those! I just haven’t ever been successful at growing my own mix of flowers, and vines in a single pot. I love the black trim, and that sun room on the side. I can see why you admire it whenever you pass by it. It’s lovely. I actually don’t much care for the urns. it’s a bit too much for my relatively simple tastes. Also, they remind me of all the cement urns that were the pride of neighbors when I was growing up. Entering into prime hiking season and everyone within a reasonable driving distance will be headed to the White Mountains for the long weekend. Not a bad idea to stay off the roads if you can. A very lovely and safe weekend to you, too, Judy. I have the hunch you will be celebrating Labor Day with — what else? — labor. May it be fun and not hot! I loved that walk of geraniums and looked for them each spring. This year they were in their store bought pots sitting on top of that mulch. I’d pass by and wonder why they weren’t planted. Then all of a sudden those massive planters showed up and blew me away. They fit the size of the house and the effect is like something out of a magazine. 🙂 Happy weekend to you as well and may we both have less humidity. Oh, wouldn’t you just love to have a peek inside as well. What a gorgeous home. Beautiful house, fantastic urns. Lots of people coming to Maine this weekend, too. Glad we live in quiet central Maine where there are fewer visitors. I know! Best to come some other time. I think the urns are gorgeous, of course, and certainly more regal, and true they fit the style and trim of the home, but I would enjoy seeing the geraniums more. I would also enjoy having the sunroom section added right out back on my own home 😉 That’s a winner of a house, Judy! I tried to think of what mine is, and it might be an orange craftsman style house round the way. I always admire it. It’s what my house would be like if it was built brand new now, only I’d still choose yellow. But you know, it’s all shiny and new and when you live in a 100 year old house, you don’t have hardly any shiny and new… LOL but I love my house *hammers up the siding that always falls* I dunno. I admire that one, always, though. I also appreciate the fact that they didn’t conform to the styles near them. I may ponder this s’more. We were in Lake Placid (heart of the Adirondacks) yesterday and I was a little surprised to see the leaves changing color! Fall is coming! 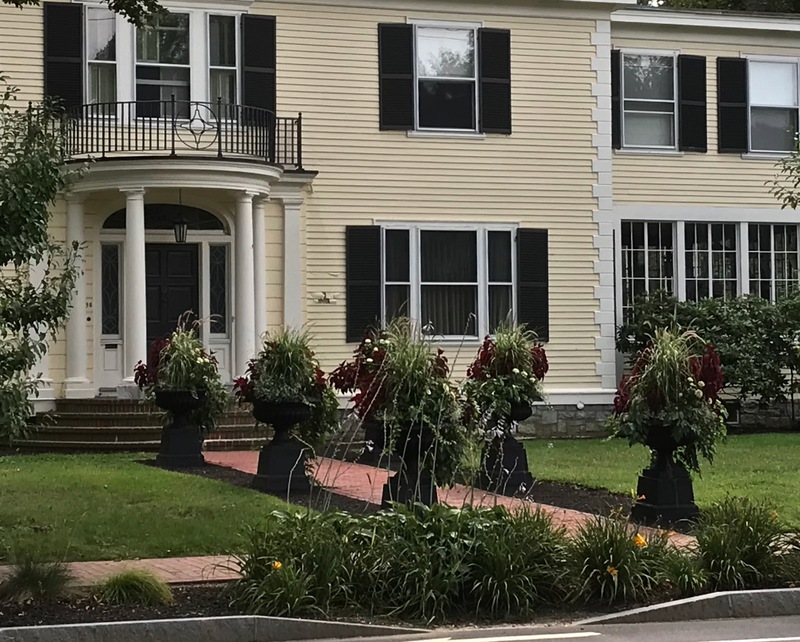 There is something about a row of urns and flowers that just says “Look at me!” That’s a very dramatic entrance to that home. I’m so sad to see the season turn Judy. I love fall but sadly winter always follows! I see what u mean about the planters, they do indeed add panache! Judy, the urns look pretty fabulous but I like the idea of the red geraniums as well. Happy Labor day! I am just seeing this Labor Day post. Wow, the house IS a show stopper and YES, those urns are a fantastic addition. I’d never guess beforehand they could look this elegant but the flower selection is spot on. Wonder what they’ll choose for autumn? It will have to be spectacular to top this!